FORT WAYNE, Ind. -- Learn from the Pros at the 2017 TinCaps Players Clinic! This clinic is for Kids Club members ages 6-12 and will be at Parkview Field on August 12th from 10AM - 12PM. Check-in will be at 9:30 AM inside the main gates and there will be a pizza party afterwards in the Huntington University Picnic Pavilion. 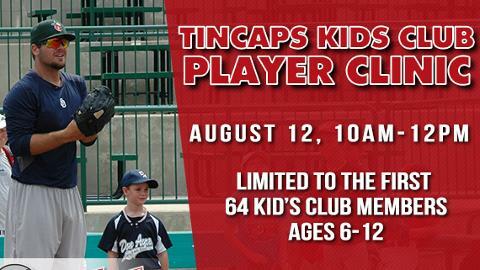 Kids Club Members will receive instruction from TinCaps Players, a t-shirt, autographs, and a post-clinic lunch. The cost is $25 and there are only 64 spots available, so be sure to sign up ASAP! Once your spot has been reserved, Aron Brecht from the TinCaps staff will send an e-mail requesting additional details pertinent to the clinic. If you aren't already a member of the Kids Club, please sign-up at tincapskidsclub.com before reserving your spot. If you have any questions, contact Aron by phone at 260-482-6400 or by email at Brecht@tincaps.com.